The details will be agreed at a meeting of vice-premiers Rosenko and Glinsky. President Petro Poroshenko and his Polish counterpart Andrzej Duda discussed historical issues at the talks in Kharkiv on Wednesday, December 13. "We agreed that history should not influence the strategic nature of the Ukrainian-Polish relations. We need to remember heroes of the past and honour the memory of innocent victims, but we must steadily move forward. 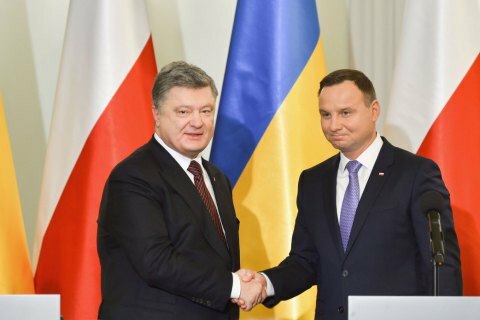 We will not change history but must and can change the world of today and create better conditions for the future so that no one can instil hatred and enmity into the hearts of Ukrainians or Poles," Poroshenko told a briefing after the meeting. "We have agreed in the near future to rise the level of the commission for cooperation on historical issues to governmental level. The commission level should be at the level of vice-premiers. On our side, we expect that it should be vice-premier Rozenko," Poroshenko said. The Polish side will be represented by Vice Prime Minister Piotr Glinski. The commission will meet in the near future to give a "green light" to scientific study, exhumation, preservation of monuments, and prevention of vandalism. "There are many historical characters that unite us, not divide, for example, Marshal Jozef Pilsudski, who along with the forces of the army of the Ukrainian People's Republic scored resounding victories over the Russian-Bolshevik invasion in the 20-ies of the last century," Poroshenko said. The president of Poland, in turn, said that lifting the moratorium on exhumation would be the first step towards the improvement of bilateral relations. He also called on politicians to refrain from harsh statements on historical topics. "Politicians should to be moderate in their statements so that they did not act emotionally. This is difficult, because many people still feel the pain of these terrible times and events that cast shadow on relations between Poles and Ukrainians," he said, . Ukrainian Institute of National Remembrance has initiated a temporary ban on the exhumation of Poles in Ukraine. The ban was in response to acts of vandalism with respect to monuments and memorials at Ukrainian graves in Poland, including the dismantling of a Ukrainian monument in the village of Krusovice near Przemysl.